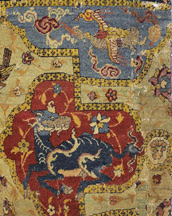 This afternoon’s visit to the Brooklyn Museum will feature a broad selection of fiber arts from the Asian and Middle Eastern collections, ranging from monumental carpets to very early fragments from Coptic sites, from the Museum’s masterpiece kalamkari (Indian painted cotton) panels to lesser-known treasures from Korea, northern Japan, and China. Curators Joan Cummins and Susan Beningson will share stories and analysis of the pieces on view. This is an extremely rare opportunity to view so many of Brooklyn’s textile treasures at one time. The Brooklyn Museum houses many unsung treasures, especially in its collections of costumes and textiles. Although the Museum transferred its Western costumes to the Metropolitan Museum in 2009, all non-Western textiles remain in the collection. In the years since the transfer, the Asian and Middle Eastern textiles have become far easier to access, allowing curators to assess and catalogue pieces that were practically forgotten. Several important conservation projects are either complete or in the planning stages. The timing has been fortunate because the Museum is also planning a reinstallation of its permanent galleries for Asian and Middle Eastern art, and curators plan to feature textiles to a greater extent than was possible in the old galleries.